I made these on a whim. My kids love chocolate chip muffins and in my quest to make more from scratch and less from boxes, as well as this challenge to try new recipes, I found this recipe on www.dishesanddustbunnies.com and adapted it for our tastes. Rather than semi-sweet chips, I used milk chocolate chips. I also cut back on the amount of vanilla. Originally the muffins were sprinkled with coarse sugar but that’s not something I buy or would use so I used regular sugar. Using cooking spray coat a 12 cup muffin pan covering the top of the pan too, so the muffins don’t stick. Place paper muffin cups into the pan. Combine flour, baking powder, baking soda and salt in a medium bowl. Stir in 1 3/4 cups of the chocolate chips. In a separate bowl, combine the cooled melted butter, eggs, milk and vanilla, making sure the eggs are well incorporated. Pour the wet ingredients into the dry and stir just until combined. Don’t over mix or muffins will be dense. You want them moist and fluffy. Evenly fill each section of the muffin pan, about 2/3 full. Sprinkle the tops of each muffin with remaining chocolate chips. Bake at 475 degrees F. for 7 minutes, then reduce heat to 375 degrees F. and continue to bake an additional 15 to 20 minutes until toothpick inserted in center comes out with a few crumbs. Remove forgiven and cool in the pan for 5 – 10 minutes. 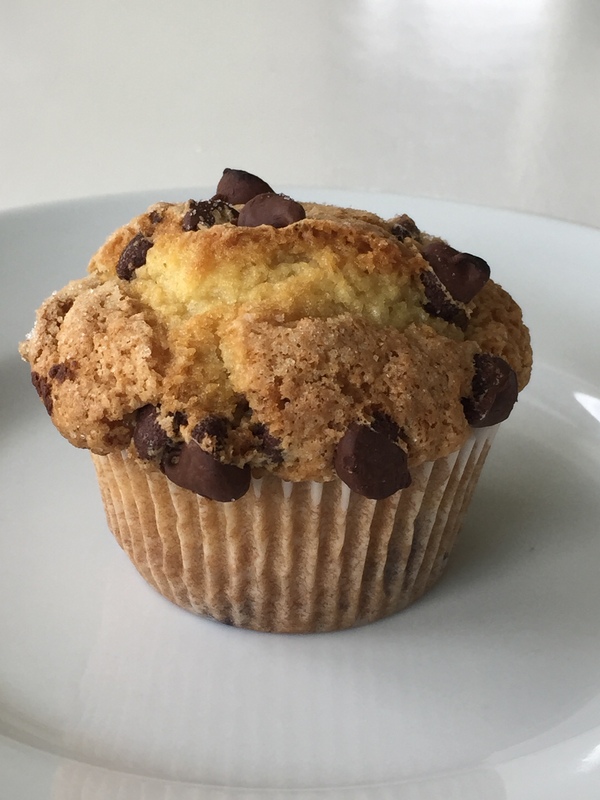 This entry was posted in 52 Week Challenge, Breakfast, Company Worthy, Kid's Favorites, Muffins and tagged 52 week challenge, 52 week new recipe challenge, breakfast muffins, chocolate chip muffins, Chocolate chips, muffins. Bookmark the permalink.